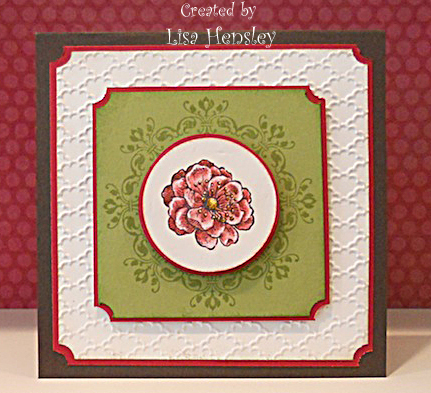 The Shabby Stamper: Creative Crew October Challenges! This months Creative Crew challenges are all about stepping it up. Make one card good; make the second card better! These two cards reflect the color focus (CCREW1012CF). This focus is all about the colors found in the Orchard Harvest dsp -- Cajun Craze, Early Espresso, Island Indigo, More Mustard, Lucky Limeade and Raspberry Ripple. 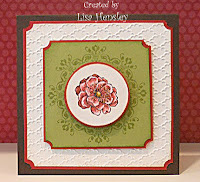 The basic card is made using Early Espresso, Raspberry Ripple, Lucky Limeade and Vanilla. I used my Big Shot and the Fancy Fan embossing folder on the Vanilla layer and lightly sponged the edges with Close to Cocoa. I used the Ticket-Corner punch on the corners and layered it with Raspberry Ripple. 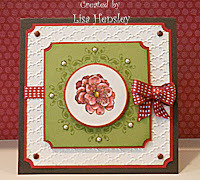 The Lucky Limeade layer is stamped with the medium-sized medallion from Daydream Medallions in Lucky Limeade. Again the corners are shaped with the Ticket-Corner punch and layered with Raspberry Ripple. 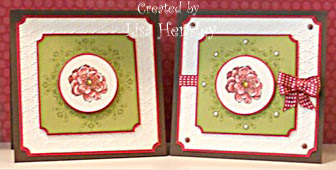 The central image is from Everything Eleanor and is watercolored using Pretty in Pink, Regal Rose and Raspberry Ripple. Highlights are added with a white gel pen and the image is punched out using the 1 3/4" circle punch and is, again, layered with Raspberry Ripple. 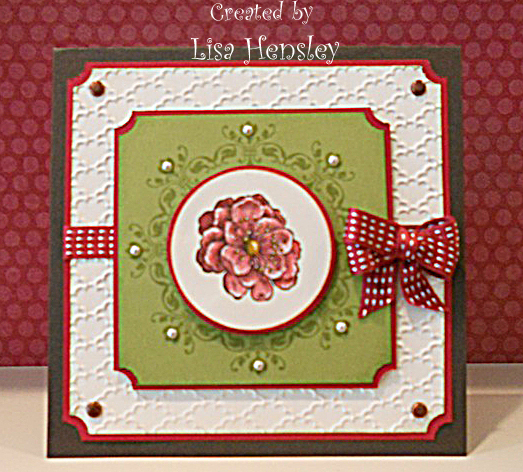 To step up this basic card, add Raspberry Ripple stitched satin ribbon across the center of the card, under the Lucky Limeade layer, as well as a cute double bow. Add brads to each of the four corners of the Vanilla layer and adhere medium-sized Pearl Jewels to the medallion.